streaming mode runs on our eS-Wifi modules. Streaming Mode allows raw, un-formatted data to be sent to and from our modules over Wi-Fi via the serial port. 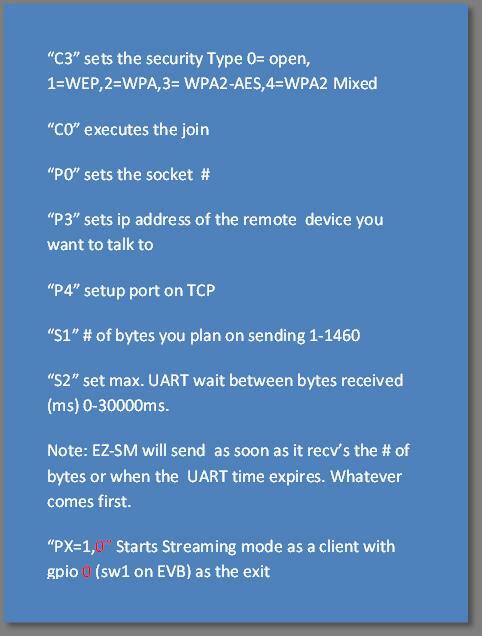 Data shows up on the UART and automatically streams wireless as either a client or a server. You need to perform simple initial AT command setup to define the mode and anything that shows up on the UART automatically is sent. Plug your eS-Wifi module into the PC and start a terminal program (Teraterm) default baud rate is 115,200 to communicate with the module. Also open Hercules as a server connected to the same network network.